You won't need to go far on Fuerteventura to find a perfect beach, even if you are intent on seeking out solitude away from other holidaymakers. The best beaches can be found around Jandia, on the southern tip of the island. Juan Gomez is one of these, with an enticing stretch of golden sand, reached by turning off the Morro Jable-Punta de Jandia road. In the same section of the island is the pebbly black volcanic beach of La Pared, while right next door is the beach of Viejo Rey, a long stretch of golden sand flanked by dunes. For real peace and quiet the black volcanic sand of Giniginamar is recommended, surrounded by palm trees and other indigenous plants. 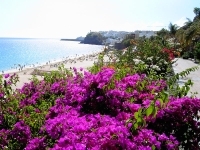 If you're looking for a family-friendly beach, the southern Costa Calma is a great option because the conditions are ideal for safe swimming and the facilities are good. For remote beaches tourists can hire a 4 X 4 and explore the tracks leading to the sea on the west coast. Nudism is tolerated on all the island's beaches. Despite the idyllic and peaceful appearance of the ocean on most of Fuerteventura's beaches, drownings do occur. Most major beaches have lifeguards and a flag system: if the red flag is hoisted swimming is considered dangerous.